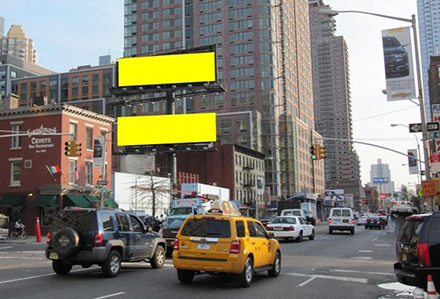 Our new left hand double-stack billboard unit is located in Manhattan's Hell's Kitchen neighborhood. This is an up and coming residential area of New York City with numerous bars and restaurants, as well as a large number of car dealerships. It is located one block from the Intrepid Sea Air & Space Museum, as well as the piers where the Circle Line NYC Water tours depart and cruise ships dock when stopping in NYC. This is an excellent, high-traffic location on the West Side, and the double-stack format offers unparalleled visibility and creative opportunities for advertisers. This large, illuminated unit delivers impact in size, placement, color and lighting. Lamar's new double stack billboard located on 46th St. and 11th Ave. in NYC. Double stack billboard units offer exciting design opportunities. 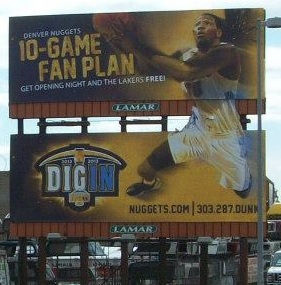 Above is a double stack billboard in Denver that featured extensions to create a dramatic impact. 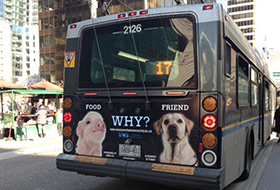 New advertisements gracing the back of city buses in Vancouver place a picture of Fido labeled “friend” beside Wilbur labeled “food” to point out the inconsistencies in peoples’ attitudes toward animals. Lamar Advertising Company (Nasdaq: LAMR), a leading owner and operator of outdoor advertising and logo sign displays, announces the Company’s operating results for the first quarter ended March 31, 2013.